PORTLAND, ORE. – JUNE 27, 2018 – Daimler Trucks North America (DTNA) announced today that Penske Truck Leasing and NFI have agreed to partner in operating the Freightliner Electric Innovation Fleet of eCascadia™ heavy-duty trucks and eM2 106 medium-duty trucks. The move is the next phase of a co-creation process that DTNA is utilizing to actively involve customers in the development of commercial electric vehicles to meet the most valid target applications. Starting late this year, Penske will begin taking delivery of 10 eCascadias and 10 eM2s for use in California and the Pacific Northwest, while 10 eCascadias will begin being delivered to NFI for drayage activities from the ports of Los Angeles and Long Beach to warehouses in California’s Inland Empire. 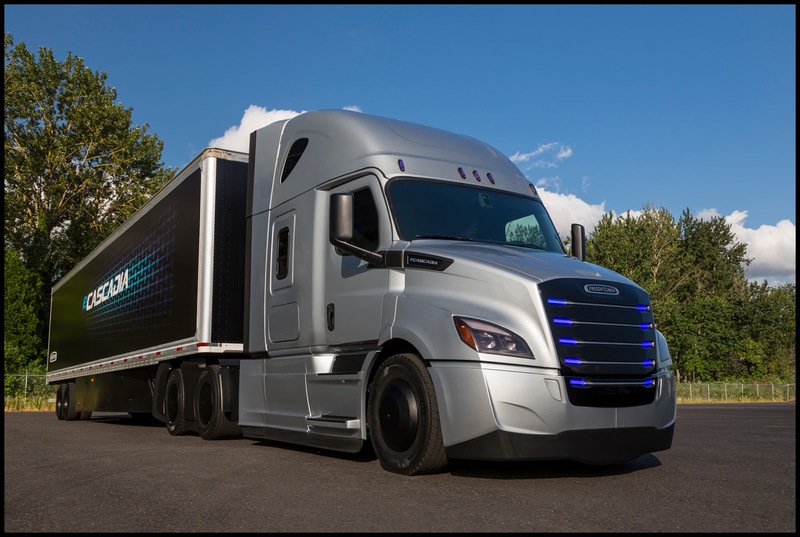 Additionally, DTNA plans to operate electric trucks within its own Product Validation Engineering (PVE) test fleet in Oregon to further expedite research and development of the technology. In preparation for the 2021 start of production, DTNA announces the Electric Vehicle Council today. The council will prepare customers, with viable use cases, in evaluating and integrating commercial electric vehicle solutions into their operations. Technical learnings from the Freightliner Electric Innovation Fleet and test fleet will be shared with the customer base in this forum. As testing progresses, the DTNA Electric Vehicle Council will discuss planned product offerings to gather candid feedback as the OEM moves towards commercialization of electrified trucks. Through the EV Council, DTNA will work hand in hand with customers, establishing the necessary charging infrastructure, vehicle deployment and service support. DTNA plans to offer customers consulting services to assist with site selection based on truck applications, available government incentives, infrastructure deployment and route identification as part of a preliminary review prior to commercial electric vehicle business proposals. At start of series production, the eCascadia will have up to 730 peak horsepower. The batteries provide 550 Kwh usable capacity, a range of up to 250 miles and have the ability to charge up to 80 percent (providing a range of 200 miles) in about 90 minutes. The Class 8 tractor is designed for local and regional distribution and drayage. The eM2 truck will initially have up to 480 peak horsepower. The batteries provide 325 Kwh of usable capacity, a range of up to 230 miles and have the ability to charge up to 80 percent (providing a range of 184 miles) in about 60 minutes. The eM2 is Freightliner’s electrified solution for local distribution, pickup and delivery, food and beverage delivery, and last-mile logistics applications. The Freightliner eCascadia with 80,000 lb. gross combined weight rating (GCWR) and eM2 with 26,000 lb. 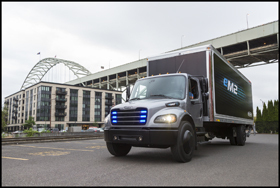 GCWR are part of Daimler Trucks’ global electrified truck initiative. The announcement comes as DTNA explores proprietary solutions to meet the most promising target applications for electrified commercial vehicles. The eCascadia and eM2 join the Thomas Built Buses all-electric Saf-T-Liner® C2 JouleyTM school bus and the FUSO eCanter to establish Daimler Trucks as the leader in North America with the widest range of commercial electric vehicle models on the road.